Audio-Technica ATH-M50xBT review | What Hi-Fi? The Audio-Technica ATH-M50xBTs are the Bluetooth version of the M50x wired headphones we gave four stars to around four years ago. This Bluetooth version behaves and performs in much the same way as that tethered stablemate – and that is pretty much a positive thing across the board. You get a fair amount for your money here – and, most importantly, a good listen when you’re out and about. The Bluetooth 5.0 version of the ATH-M50x looks and feels similar to its wired sibling, which means good-quality plastics on the earcups and headband, and well-padded earpads. While these headphones don't have active noise-cancelling, the over-ear design, with those fairly thick pads, nevertheless makes an effective seal against the outside world for decent passive noise-exclusion. The left earcup houses all the clever tech, with a switch to turn Bluetooth on and off, three buttons – for volume up, volume down (those buttons also acting to skip tracks forward or back with a longer push), and play/pause and end phone-calls. In among the buttons there are also sockets for the micro-USB charging cable and 3.5mm headphone cable – both of which are supplied, along with a storage pouch. Finally, there's a touch panel in the middle of the left earcup, which complements the visible buttons on its edge. Pressing this allows access to the speech-recognition assistant on your device (Siri, Google assist etc). The headphones are certainly designed with portability and out-and-about listening in mind. They fold up to about half-volume with a push of the ear-cups up into the headband, the joints swivelling and folding to accommodate as necessary. The storage pouch provided is barely big enough to house the cans in that state, but manages as a protective measure inside a bag. The cable provided – which has a mic and play/pause/answer call button – is just 1.3m long; enough for listening on a commute, but not really suitable for home listening. In a change from the non-Bluetooth pair, the 3.5mm connection isn’t a push and twist affair, but it is still not quite standard, with a recessed section to allow a firm fit. That means care will need to be taken if you want to invest in a longer cable. Audio-Technica claims a 40-hour battery life for the headphones’ Bluetooth functionality, on a full charge of around seven hours. The headphones beep to warn you that the battery is running low. Setting up your headphones is a simple operation; just slide the button on the earpiece and the unit will be discoverable. For any additional devices, just make sure the headphones aren’t already connected to another unit – that is the only issue we have with connecting via Bluetooth. Once set up, the ATH-M50xBTs are an enticing, easy listen. The midrange is particularly impressive, with vocals and the jangly guitar coming across crisp and clear in a Tidal Masters stream of The Jackson 5’s I Want You Back. The track as a whole is conveyed with suitable verve and joy and has our foot tapping in no time. It’s extremely easy to get lost in the music – which is pretty much ideal in a pair of cans such as this. However, the track also highlights one notable blemish to the sound. Once that familiar bassline kicks in, it takes position somewhat to the fore of proceedings – it’s not a huge issue, but it is certainly true that these headphones are fans of the lower registers in a way that's not altogether authentic. That forward bass does contribute to the easy-listening and warm nature of these cans, and there are no issues with overly sharp or bright treble notes, but some rivals will offer a more purist, precise rendition of the music. For many people on their daily commute that simply won’t be an issue – and indeed, for much of our time with the ATH-M50xBTs it isn’t for us – but it’s something to be at least considered. The earpads make an effective barrier against the outside world, and commuting with the Audio-Technicas, we feel nicely cocooned against any distractions – while still being able to hear any important announcements. But, after a while, our ears get rather warm. While that’s a positive bonus in the wintry February air, it may well become more of an issue in the warmer months. That said, the fit and comfort of the earpads is decent, even for those wearing glasses, and while the fit is firm, it is not uncomfortable over extended listening periods. 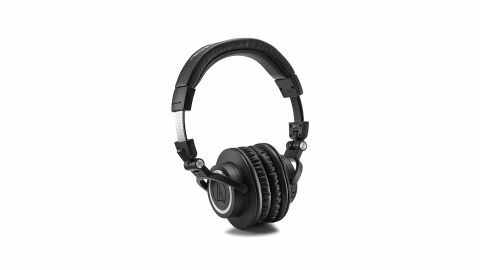 The Audio-Technica ATH-M50xBT headphones carry on the good work started by their wired siblings – adding to the mix a strong wireless connection over Bluetooth, with good battery life and the option of going wired if you get caught short for power. They’re not overly analytical or neutral in their presentation of music, but make for an enjoyable, comfortable listen, which is what many of us want from a pair of headphones. Certainly a pair for your shopping list if you’re in the market.